While doing a little searching tonight, I came across an interesting article from the December 15, 1902 edition of the Philadelphia Inquirer. It highlights a Philadelphia resident named Isaac M. Marshall who claimed to have been among the guards detailed the watch over the Lincoln assassination conspirators during their trial and imprisonment. The article gives some candid thoughts that Corporal Marshall had about the conspirators, which I thought would be worth sharing. Living at 3213 Mt. Vernon street is a veteran of the Civil War – Isaac M. Marshall – who was one of the guards of the conspirators in the assassination of President Lincoln, and who has still a vivid recollection of how they looked and acted when on trial for their lives at the old Arsenal in Washington. “I was a member of Company I, of the Third Regiment, Hancock’s Veteran Corps, at the time,” he said yesterday to a reporter of The Inquirer. “We were camped outside the capital in 1865, and the morning after the great crime had been committed we got orders to watch all the approaches leading from the city. The entire regiment was given this duty and no one was allowed to go through the lines without establishing his or her identity, and that they had a right to pass on. “Later on our company was at the Arsenal during the trial of the men and Mrs. Surratt. I remember all of the conspirators well. Lewis Payne, one of those who were hanged, always wore a knit shirt. He was stalwart and of athletic build and had an eagle eye. The stern look on his face never appeared to change. David E. Herold was handsome, and he knew it. He had long black hair and he frequently pushed it above his forehead. There were many young women present – admitted by card – and to some of these he frequently bowed. One of his peculiar actions was to raise his hands so that they could see his manacled wrists. 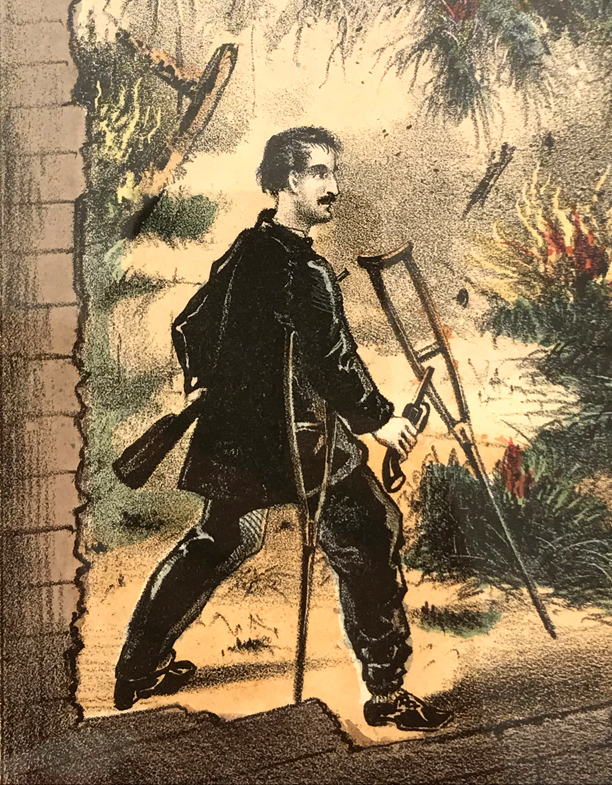 “Of Samuel B. Arnold, whose story of alleged cruel treatment I have read with deep interest, as it appears from day to day in The Inquirer, I want to say this: Whatever may have happened to him at the Dry Tortugas, he did not look as if he had suffered any before his trial occurred. On the contrary, he appeared to have been well fed and otherwise well cared for. You could scarcely tell what kind of a man he was. At times his countenance wore a look of defiance; then of sternness and again of unconcern. He was neatly attired, as were all the others, save Payne, who managed to change his clothes after the crime, assuming the garb of a laborer. 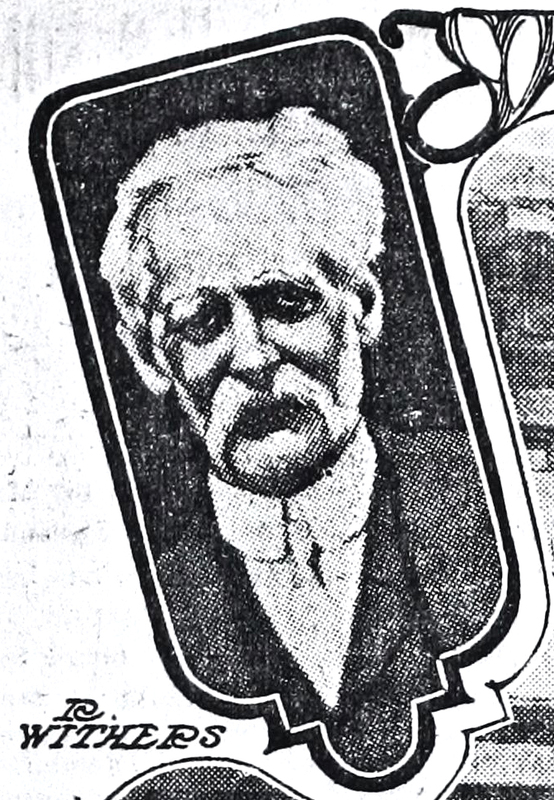 Marshall’s extended comment about Samuel Arnold is due to the fact that this article came out in 1902, the same year that Arnold allowed his lengthy memoirs to be printed in the newspapers after he had read his own obituary. In his memoir, Arnold complained at length about the treatment he received at the hands of the government. Marshall provides a small rebuff to Arnold’s claims that he was mistreated while in Washington (though considering the hoods Arnold and the others were forced to wear, you can’t blame him too much for complaining). The other descriptions of the Lincoln conspirators are very much in line with what other visitors of the trial observed. While I can’t positively confirm that Isaac Marshall was one of the guards at the trial of the conspirators, it seems fairly likely he is telling the truth. The Old Arsenal Penitentiary, where the conspirators were imprisoned and tried, was largely manned by members of the Veteran Reserve Corps, which Marshall was a member. On the day of the execution of the conspirators, Marshall’s specific group, the Third Regiment, was assigned duty as sentinels from the northeast corner of the arsenal grounds extending along the east bank of the river. Members of the 3rd regiment were also stationed in a line 100 yards south of the prison grounds. So, at the very least, Marshall did have guard duty on the day of the conspirators’ death. Even Marshall’s claim to have been in Springfield when Lincoln was buried is possible. 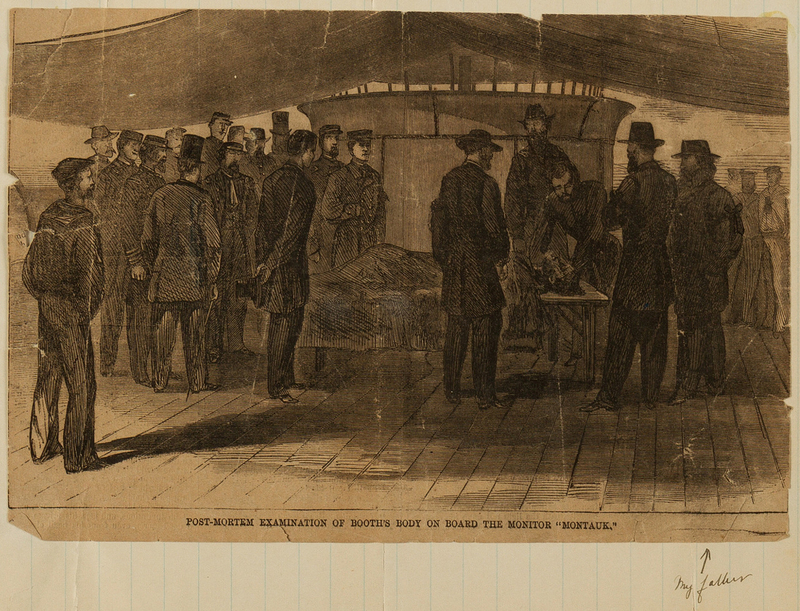 The Third Regiment wasn’t officially mustered out of service until December of 1865 and Abraham Lincoln’s remains were “buried” in a temporary vault in Oak Ridge Cemetery on December 21, 1865. Isaac Marshall may have had the unique experience of being present at both the execution of the conspirators and at one of Abraham Lincoln’s many burials. Isaac Marshall died on July 6, 1919 and is buried in Fernwood Cemetery, outside of Philadelphia. (1902, December 15) Helped to Guard the Conspirators. Philadelphia Inquirer, p 5. On August 13, 2018 at around 10:15 pm, BoothieBarn officially reached over one million views! I announced similar milestone moments when this blog made it to 10,000 and 100,000 views. I was happy then and I’m ecstatic now that this blog continues to grow at such an amazing pace. While the vast majority of the visitors to this site come from the United States, this blog has been able to make a splash internationally as well. Here’s a map showing all the places that have visited BoothieBarn.com since its founding in 2012. Granted, the map isn’t completely filled up. Clearly I have to do more outreach in places like Chad, Greenland, Lesotho, Tajikistan, Svalbard, the Solomon Islands, Djibouti, and others. 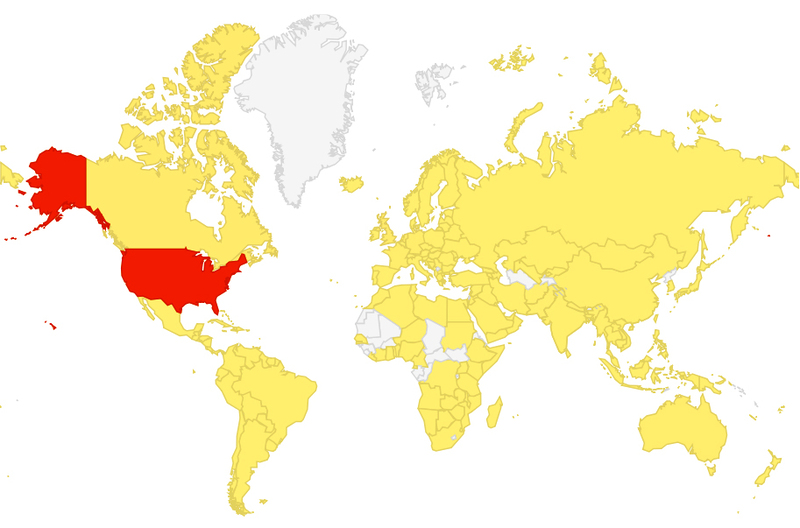 Still, I’m very pleased this site has found such a global audience especially since it deals with a uniquely American story. I’d just like to thank you, the readers, for all of your support and community over these past six years. I’m especially grateful to those of you who have graciously donated to this site through Patreon. I have been blown away by the level of generosity and am so very appreciative of it. With this level of continued support, I’m hoping to bring even more exciting things to BoothieBarn in the future. With one million views there’s no stopping us. Thank you all for reading, commenting, and giving to BoothieBarn. Music was a crucial part of the theater experience in the Civil War era. Even during non-musical performances (like the comedic play Our American Cousin) an overture and entr’acte music were expected by audiences. Theaters were houses of entertainment and an orchestra was part of what you paid for when you bought your ticket. We know that Ford’s Theatre had an orchestra. We know that President’s Lincoln’s party, arriving late to the theater, was greeted by that orchestra. But how much do we really know about the musicians who played that fateful night? 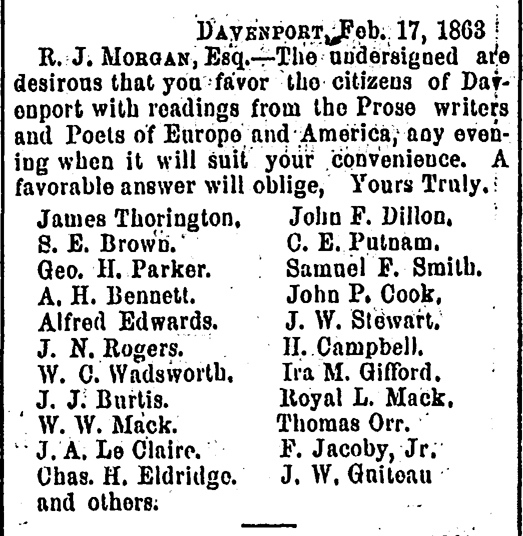 Below you will find little biographies of each man and the evidence we have about their presence at Ford’s Theatre. I’ve placed them in an order that arranges them from more likely to have been at Ford’s to less likely to have been at Ford’s. Judge the evidence for yourself as we explore the boys in the band. In 1862, when John T. Ford first remodeled the Tenth Street Baptist Church and opened it up as Ford’s Atheneum, he hired a musician named Eugene Fenelon to be his orchestra director. As director, Fenelon not only conducted the orchestra on a nightly basis, but was also tasked with the duty of recruiting and hiring musicians to ensure that Ford would have an ample sized band each night. In this capacity, Fenelon recruited local D.C. musicians. Fenelon remained as Ford’s orchestra director until a fire struck Ford’s Atheneum in December of 1862. The loss was a hefty one for John Ford at about $20,000. Consumed in the fire was a bulk of the orchestra’s instruments and music. 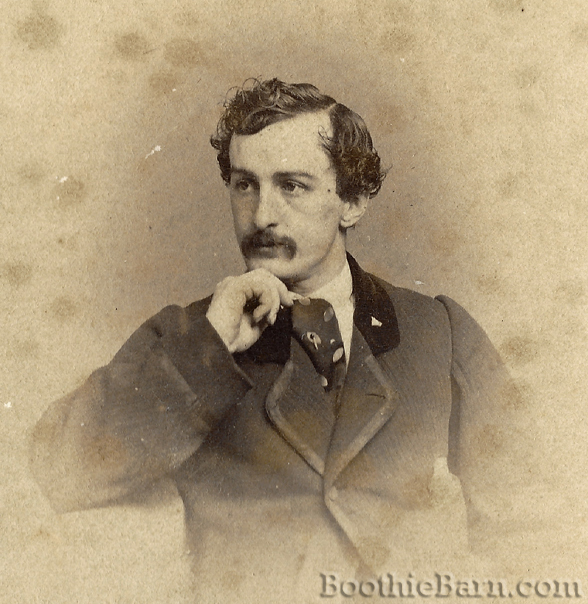 While Fenelon stayed in D.C. during the process of rebuilding that followed, when the new theatrical season opened in the fall of 1863, Fenelon took a job as the orchestra leader of the recently opened New York Theatre in NYC. Ford was then tasked with finding a new orchestra leader for his new theater. He chose to put his faith in a 27 year-old violinst and Union veteran, William “Billy” Withers, Jr.
Withers was from a musical family and, at the beginning of the war, he and his father and brothers had joined the Union army and served as members of a regimental band. The bands provided music during marching and aided with the morale of the men. In the late summer of 1862, however, Congress passed a law abolishing regimental bands, feeling that the service had been abused by non-musical men trying to avoid regular duty and that the bands were not worth the cost during war time. Though Withers stayed on for some time after the dissolution of his band and acted as a medic, he was eventually discharged. 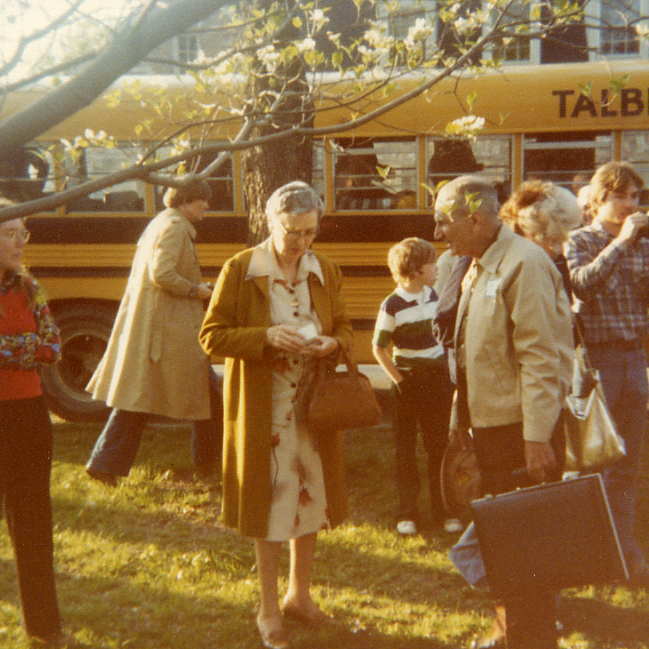 Withers excitedly took up John T. Ford’s offer to be his new band leader. When the new Ford’s Theatre opened in August of 1863, Withers’ orchestra, and his experience playing patriotic music was complimented. Ford’s Theatre had always had a healthy competition with their Washington rival, Leonard Grover’s National Theatre. As the two leading theaters in the city, the press abounded in making comparisons between the two houses. One way the theaters rivaled each other was with their orchestras. While a normal theater orchestra at the time would contain about ten musicians on a nightly basis, both Ford’s and Grover’s began advertising that their orchestras had been “augmented” to include more musicians. It appears that Withers continued to augment the orchestra during his tenure and found his growing of the band to be a point of pride. 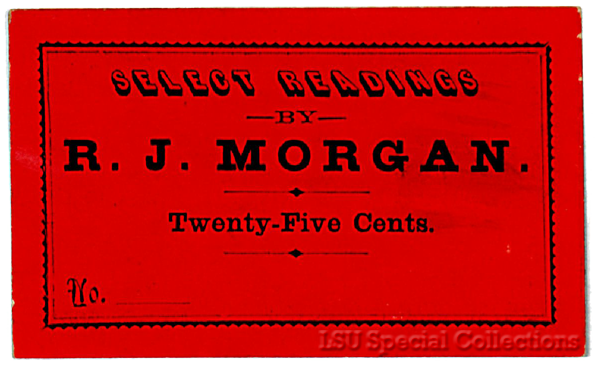 “Our orchestra under the Brilliant Leader Prof. William Withers, Jr. is considered second to no theatre South of New York,” proclaimed one Ford’s Theatre advertisement. Another highlighted the fact that the orchestra, “has lately been increased and numbers now nearly a Quarter of a Hundred first class Instruments,” and that it had been, “lately largely augmented and is now unsurpassed in numerical and artistic strength.” Billy Withers was a great asset to Ford during his first theatrical season. 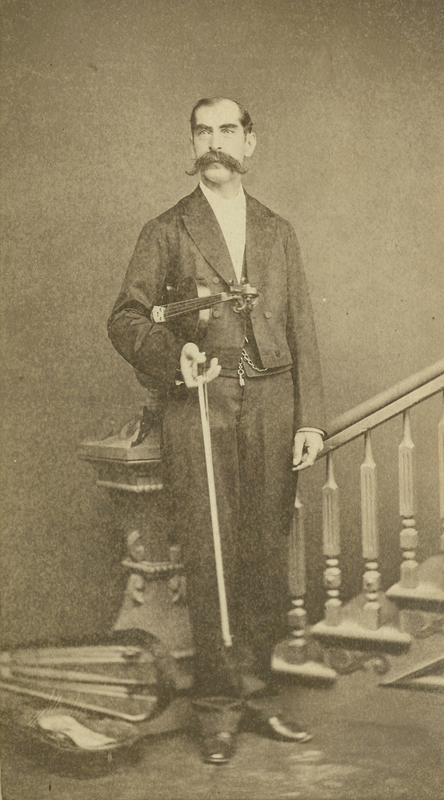 In addition to his duties as conductor of the orchestra, Withers would occasionally volunteer his services as a solo violinist for special occasions. Theatrical seasons ended during the hot months, which left many musicians without jobs during the summer. Without the steady (albeit small) income from the theaters, musicians had to make their own arrangements. During this time, many teamed up with other musicians to play small concerts in music halls. With his connections, Withers was able to rent out bigger venues. During the summer of 1864, Withers and his orchestra played concerts at both Grover’s and Ford’s theaters. 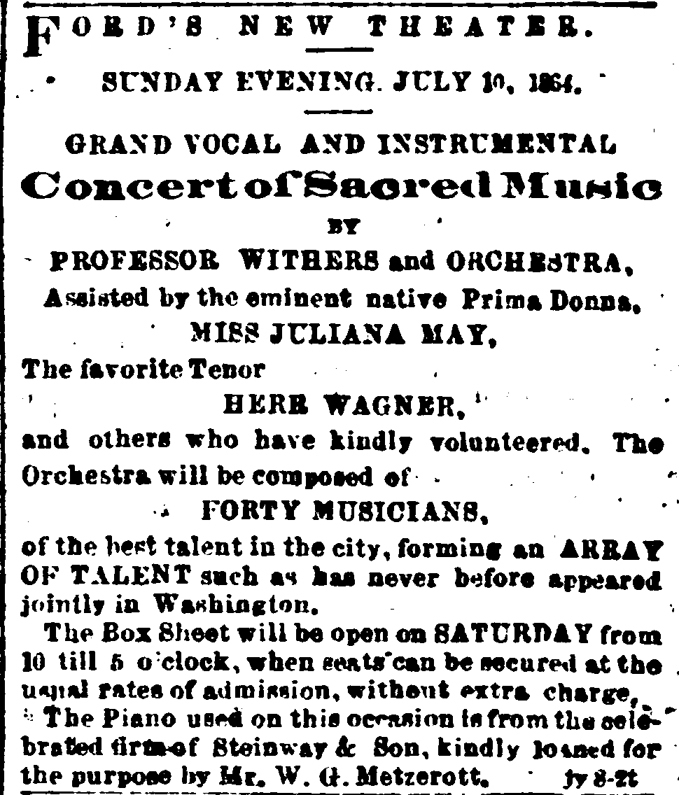 On July 10, 1864, Withers presented a “Concert of Sacred Music” at Ford’s during for which he brought in two vocalists and, “forty musicians of the best talent in the city, forming an array of talent such has never before appeared jointly in Washington.” The concert was well received and the proceeds helped the D.C. music scene make it through the lean summer. 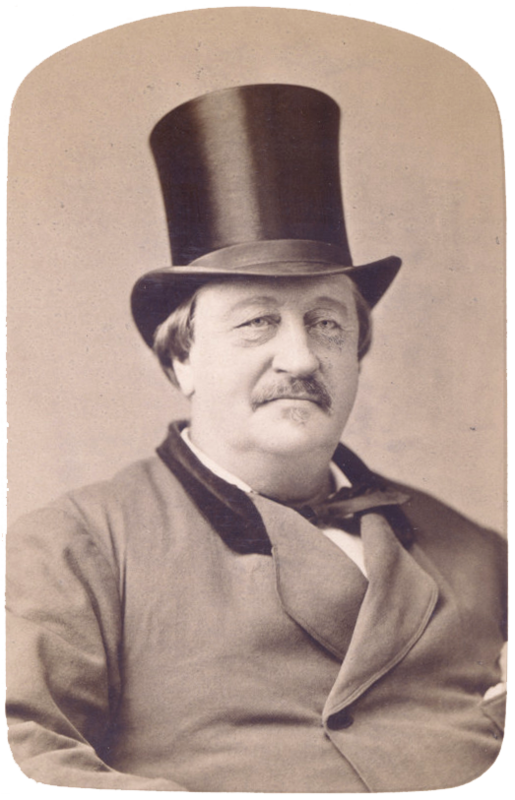 When the 1864-65 theatrical season opened in the fall, Withers was rehired by Ford to be his orchestra director. The season started without a hitch but, in January of 1865, Withers experienced some unaccustomed criticism of his orchestra in the press. In comparing the two main D.C. theaters, a reviewer from the National Intelligencer stated that, “In some respects, Mr. Ford has done better. His theater has been uniformly dignified, and he has succeeded in procuring a different class of stars from those played by his competitor…but his stock company has not by any means been all that it should be, and his orchestra needs improvement.” It appears that, perhaps due to this critique, Withers began the process of augmenting the Ford’s Theatre orchestra again. 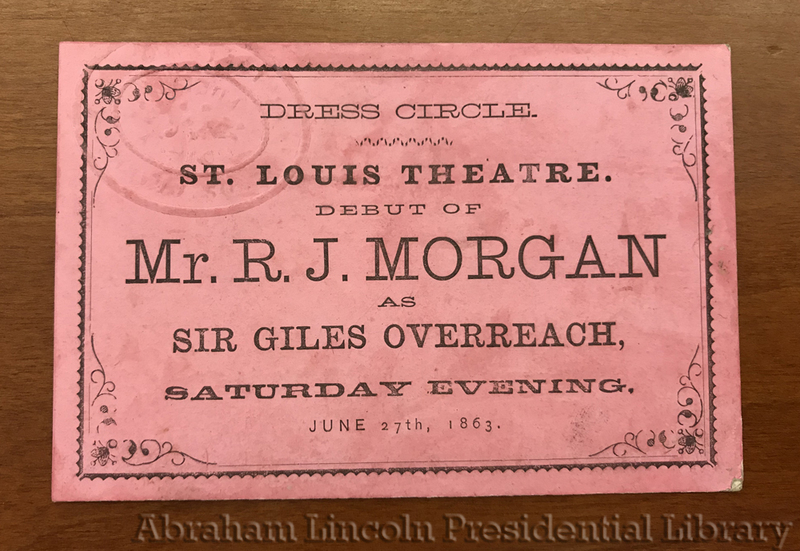 His attention on the theater orchestra was a bit distracted however, as Withers was chosen to provide some of the music for President Abraham Lincoln’s second inauguration ball. He entered into a contract in which he would be paid $1,000 for forty pieces of music. Withers not only used the local talent at his disposal but also brought in musicians from New York. After the inauguration was over, it’s likely that a few of these musicians from New York were hired by Withers to augment the Ford’s Theatre band. Rather than run off to Grover’s National Theatre, as Ford thought might occur, William Withers stayed at Ford’s Theatre and likely reduced his orchestra as ordered. In addition to being a band leader and talented violinist, Withers also composed music. He wrote several polkas and instrumental pieces which were sold by local music shops. 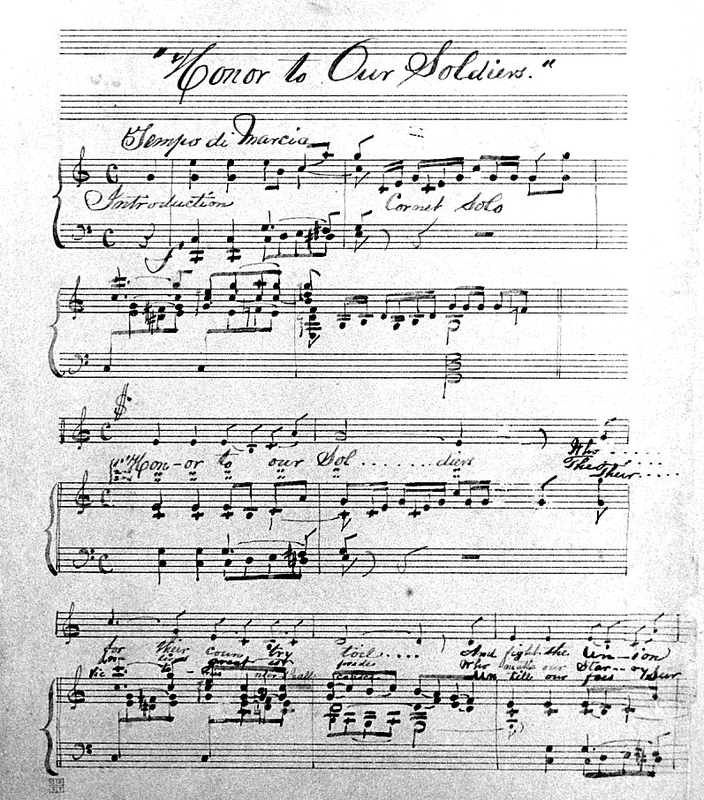 Another piece that he composed that he had not published was a song called “Honor to Our Soldiers”. With the Civil War coming to an end in April of 1865, Withers was looking for a chance to perform his own patriotic air, which featured vocalists. 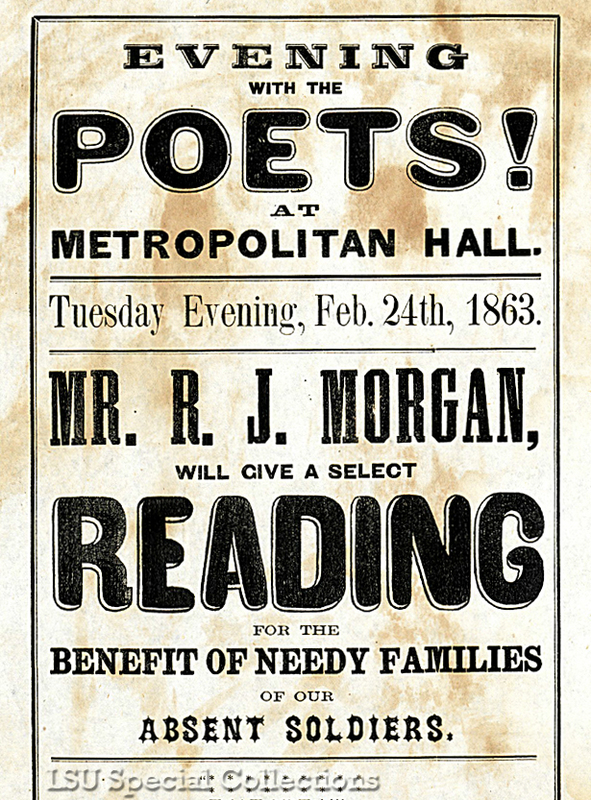 He had arranged for a quartet of vocalists to perform the song on the evening of April 15th. However, during the morning rehearsal for Our American Cousin on April 14th, Withers heard the news that the Lincolns, possibly joined by the Grants, were coming to the show that night. Performing his song in front of the President and General Grant would make for a much better debut and so he decided to perform the piece that night instead. Not having time to arrange for formal vocalists for that night, Withers was forced to rely on the talent around him. Withers tapped three of his coworkers to sing solos in the song: May Hart, Henry B. Phillips, and George M. Arth. May Hart was a new member of the Ford’s Theatre stock company having been recently transferred from the Holliday Street Theatre in Baltimore. She was performing the minor role of Georgina that night. H. B. Phillips was the acting manager at Ford’s and it was his job to improve the quality of the stock actors. 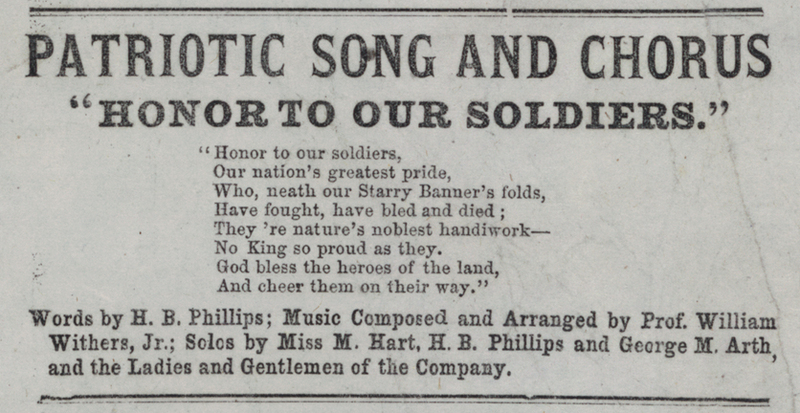 Phillips is credited as having written the lyrics for “Honor to Our Soldiers”. George Arth was actually a member of the Ford’s Theatre orchestra who is discussed later. In addition to these soloists, lead actress Laura Keene said she and other members of her company would be happy to sing along as back up. As we know, the Lincoln party did not arrive at the theater on time. Knowing they were on their way, Withers was given instructions to play a longer than average overture in hopes they would appear. After 15 minutes elapsed without the Presidential party, the play began without them. 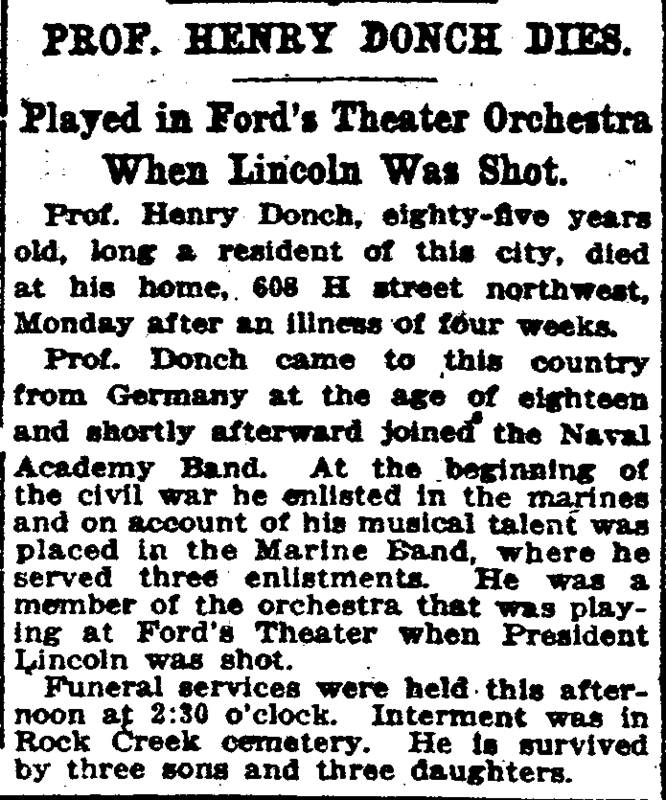 When the Lincolns, Major Rathbone, and Clara Harris did make their appearance, the play was halted and Withers and his orchestra began playing “Hail to the Chief”. This was followed by a rendition of “See, the Conquering Hero Comes” as the Lincolns and their guests took their seats in the Presidential box. With that, the play went on. Withers was initially promised that the performance of his song would occur during the intermission between the first and second acts. However, when the intermission came, he was told by stage manger John Wright that Laura Keene was not prepared to perform during this break and that the orchestra should play his normal intermission music instead. Though slightly annoyed, Withers was assured the song would be performed during the next act break. When the second act break came, however, Withers was once again informed that Laura Keene was not ready. When the third act began, Withers made his way out of the orchestra pit by means of the passageway that led under the stage. He was miffed that his song had been delayed twice. He made his way up one of the two trapdoors on either side of the stage and went to converse with John Wright backstage. 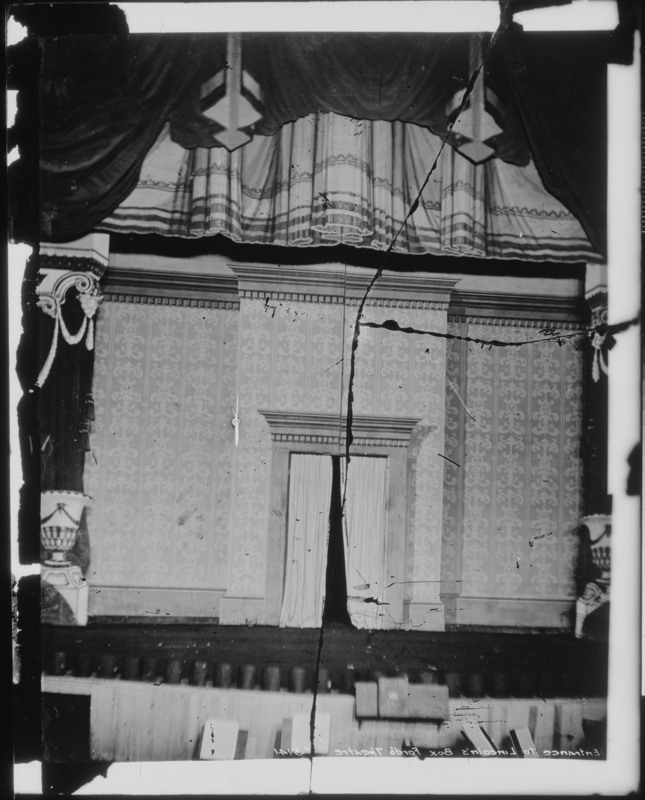 Wright said that Withers should plan to perform the song at the conclusion of the play and that Laura Keene had already sent word to the Presidential party to please remain after the curtain fell. Angry at Wright, Withers spied Ford’s stock actress Jeannie Gourlay also backstage and went over to talk with her. It while was Withers was conversing quietly with Jeannie Gourlay about his troubles that the shot rang out. What occurred next has been well documented. 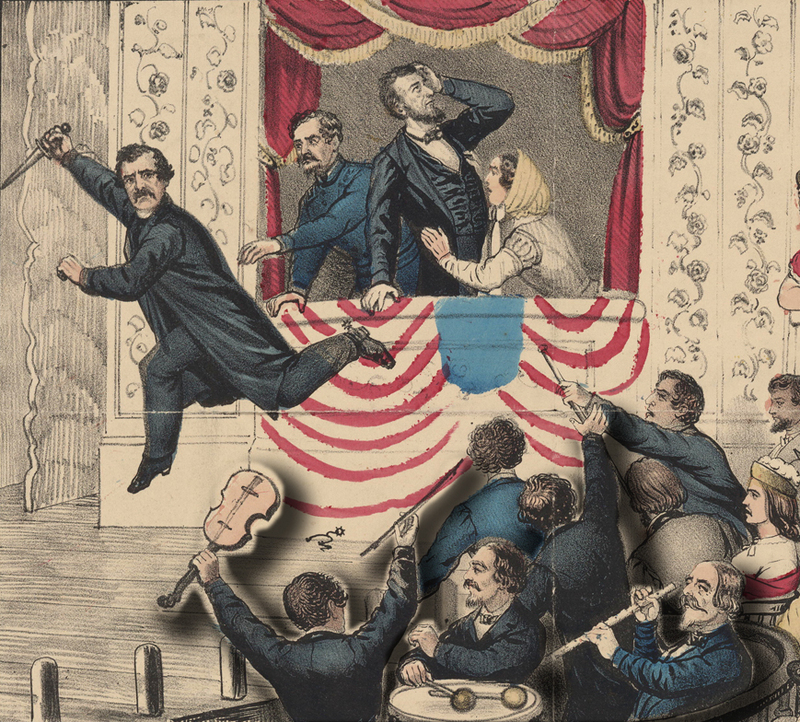 After shooting the President and slashing away Major Rathbone with his knife, John Wilkes Booth jumped from the Presidential box onto the stage. 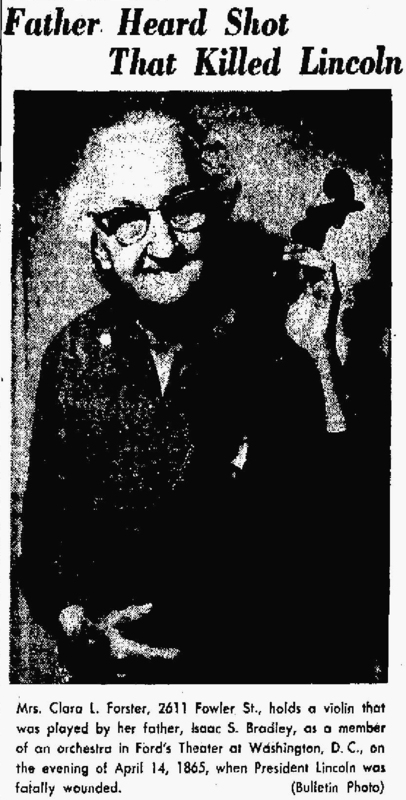 The only actor on stage at the time, Harry Hawk, turned and ran out of Booth’s path. Upon reaching the backstage, it was William Withers and Jeannie Gourlay who stood in the way of Booth’s exit. 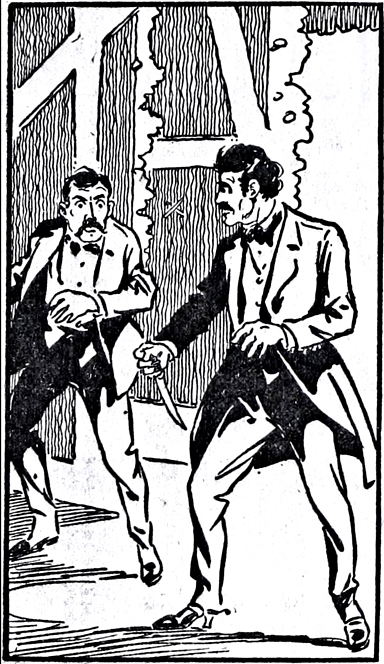 “Let me pass!” Booth yelled as he slashed at Withers with his knife, cutting his coat in two places. Booth pushed past Withers and Gourlay, made his exit out the back door, and escaped on horseback into the Washington streets. Withers’ backstage encounter with Booth became a well known part of the assassination story and up until his death in 1916, the orchestra leader never passed up an opportunity to tell his tale. 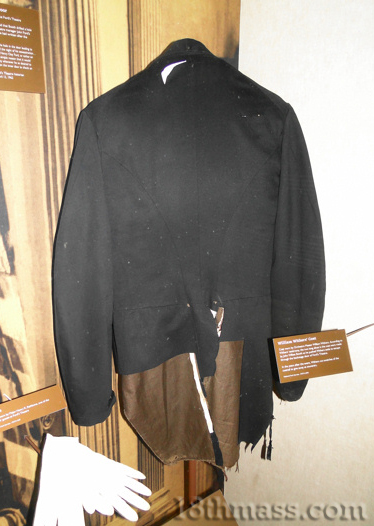 As far as evidence goes, William Withers’ attendance at Ford’s Theatre that night is airtight and even his slashed coat is on display in the Ford’s Theatre museum. To read more on William Withers, pick up Tom Bogar’s book, Backstage at the Lincoln Assassination, or check out the following articles by Richard Sloan and Norman Gasbarro. Like William Withers, George Arth came from a musical family. At least two of his brothers and his cousin were active in the D.C. music scene. In August of 1861, George Arth joined the U.S. Marine Band, known as The President’s Own band. Arth could play many instruments, but his role in the Marine Band was that of a bass drummer. With the Marine Band, Arth would perform at important events around Washington, often for the President or other dignitaries. The job wasn’t full time, however, and many members of the Marine Band had other jobs in the city as music teachers or as theater orchestra members. In 1864, while Laura Keene was renting out and appearing at the Washington Theatre in D.C., she hired George Arth to be her orchestra director for the engagement. The job was temporary, however, and when she left the city, George Arth went back to being just an ordinary orchestra member at Ford’s Theatre. Arth must have had a good singing voice since, as pointed out earlier, he was one of the Ford’s employees that Withers pegged to help him in the singing of his song, “Honor to Our Soldiers”. While we do not have any record of Arth’s whereabouts during the assassination, we can safely assume he was somewhere on the premises preparing for the song when the shot rang out. An additional piece of evidence we have that places George Arth at Ford’s that night is a letter he wrote in the days following the assassination. After Lincoln was shot, the theater was shut down and subsequently guarded. 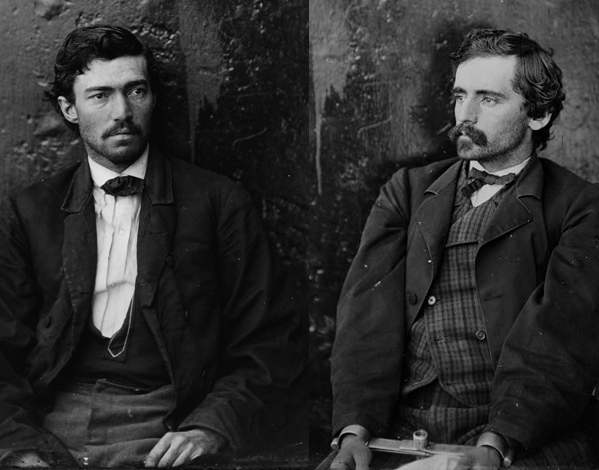 Members of the Ford’s Theatre staff were brought in for questions and some were arrested. On a normal night, it was typical for the musicians to leave their instruments in the theater, especially when they were engaged to play the next day. While Arth likely assumed that the next night’s performance at Ford’s Theatre wasn’t going to occur, in the chaos that ensued after Lincoln was shot he was apparently unable to retrieve his own instrument. Unlike some of the other musicians who may have carried their instruments out of Ford’s with them, Arth played the largest bowed instrument in the orchestra, a double bass. After the government locked down Ford’s and started guarding it, no one was able to take anything out of the premises. On April 21st, Arth wrote a letter to the general in charge of the guard detail asking for permission to retrieve his trapped instrument. I beg of you to grant me a permit to enter Fords Theatre & bring from it mu double bass viol & bow belonging to me & used by me as one of the orchestra at said theatre – as it is very necessary to me in my profession & I am suffering for its use. Arth’s request was approved and he was allowed to retrieve his double bass. Arth remained in D.C. after the war and continued working as musician. 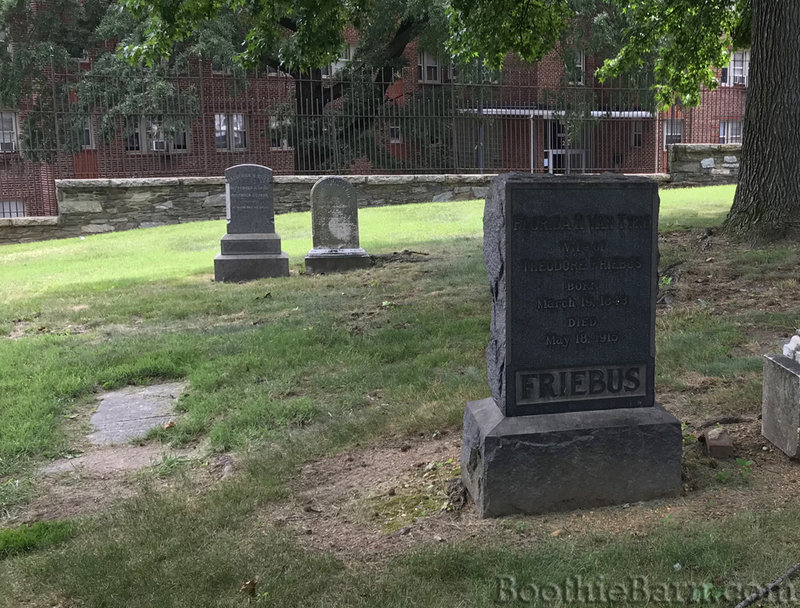 He died in 1886 at the age of 48 from consumption and was buried in Congressional Cemetery. A native from Italy, Scipione Grillo became a naturalized citizen in 1860. He originally made his home in Brooklyn, New York where he offered his services as a music teacher. By 1861, however, he had relocated his wife and kids to Washington and in July he joined the Marine Band. In addition to being a musician Grillo was a bit of a businessman. When John T. Ford rebuilt his theater after the 1862 fire, he devoted space on the first floor just south of the theater lobby to the creation of a tavern. As part of his property, Ford could lease it out for a profit and provide an easily accessible place for patrons to get drinks between acts. The tavern space was eventually leased by two Marine Band members, Peter Taltavul and Scipione Grillo, who co-owned the venture. They called their establishment the Star Saloon after the theatrical stars who would patronize it. On the night of Lincoln’s assassination, it was Taltavul’s time on duty and he acted as barkeep to the thirsty theater-goers. Taltavul has become famous for pouring John Wilkes Booth his last drink before the actor assassinated Lincoln. Grillo also stated that he was still inside of the Star Saloon when the assassination occurred. So, while he did not witness the assassination firsthand, he was among the members of the orchestra that night. Since it was part of the Ford’s Theatre building, the Star Saloon was also closed by the government, which ended Taltavul and Grillo’s business together. Scipione Grillo appears to fall off of the map after his 1867 testimony. I have not been able to find any trace of him after that, but it is possible he, his wife, and children traveled back to Italy to live. Louis Weber had been born in Baltimore in 1834 but his family moved to D.C. when he was four years old. He became a member of the U.S. Marine Band and played at the inauguration ceremonies for Presidents Buchanan and Lincoln. He was an active member of the Marine Band for 25 years. 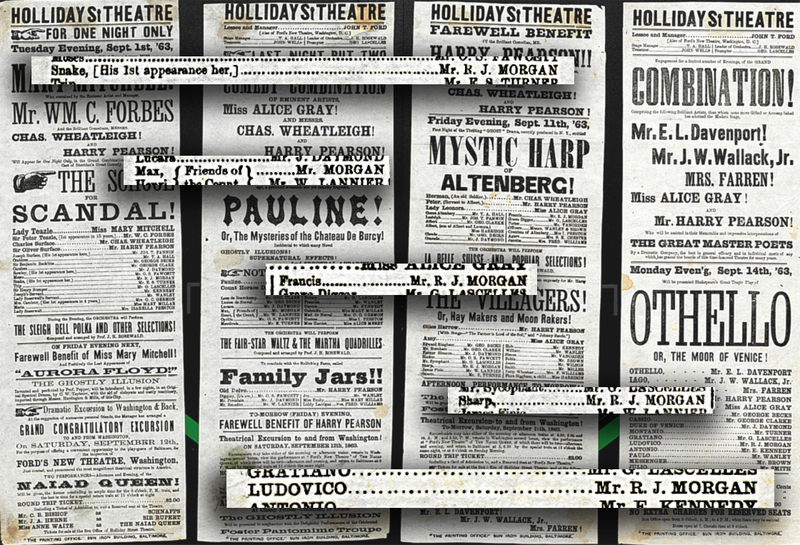 In the same manner as George Arth, the evidence pointing to Weber being a part of the Ford’s Theatre orchestra was the return of his instrument by the government. 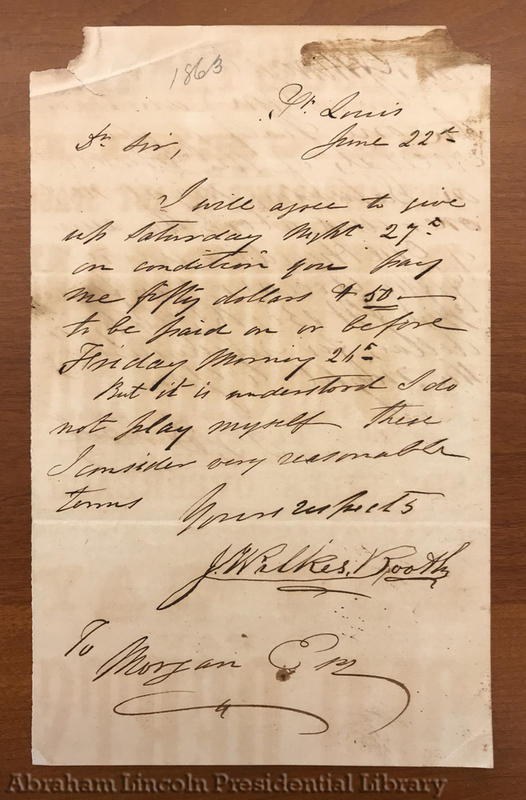 While Weber’s original request does not seem to have survived, on April 28th, Col Henry Burnett (later one of the prosecutors at the trial of the conspirators) sent a telegram off to the general in charge of the Ford’s Theatre guards ordering him to, “send to this office, one bass violin the property of Louis Weber”. 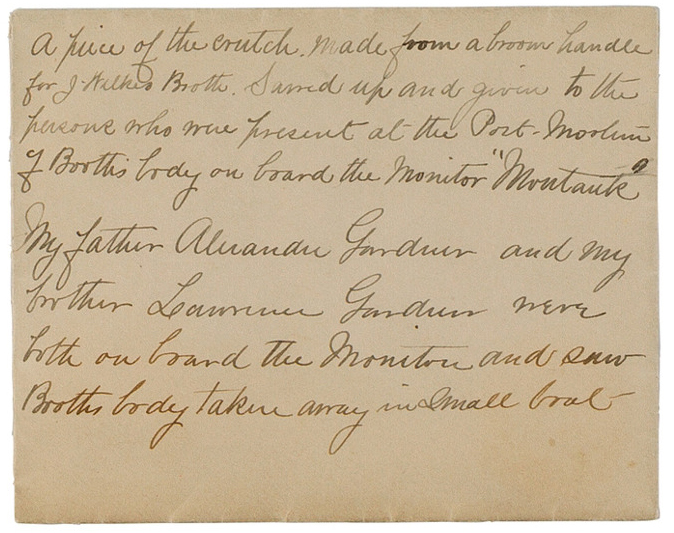 This order was fulfilled and later that same day, Louis Weber signed a receipt for his bass. Weber lived out the remainder of his life in Washington. 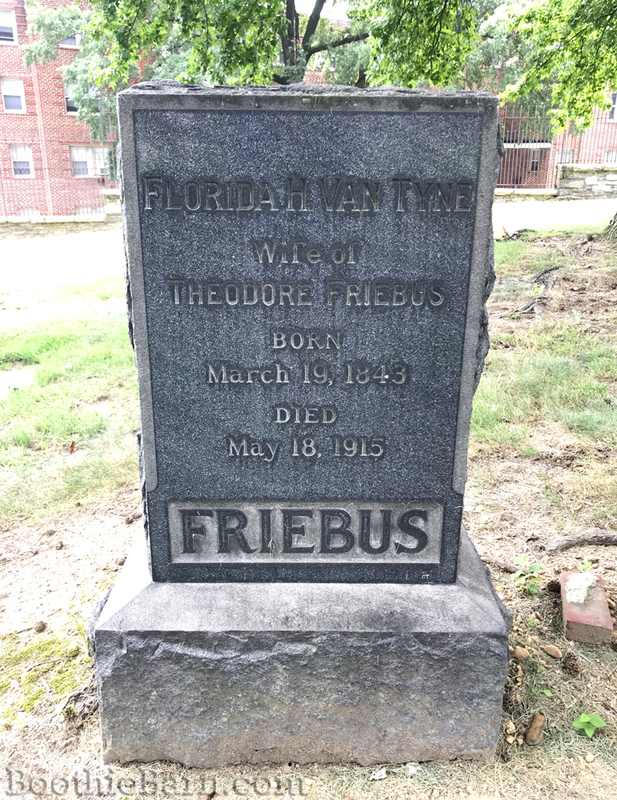 He died in 1910 from a stroke and was buried in Congressional Cemetery. William Musgrif was born in England in 1812. After immigrating to America he settled in New York. As a musician, Musgrif was skilled in both the violin and the cello, but seems to have preferred the cello best. In 1842, Musgrif and his cello became founding members of the newly established New York Philharmonic. As part of the Philharmonic, Musgrif mentored younger players in the cello. By 1860, he, along with his wife and son, had moved to D.C. where he offered his skills as a music teacher. Musgrif was also the conductor for his own group in D.C. called the Mozart Society. These items were inspected and then delivered to Withers. 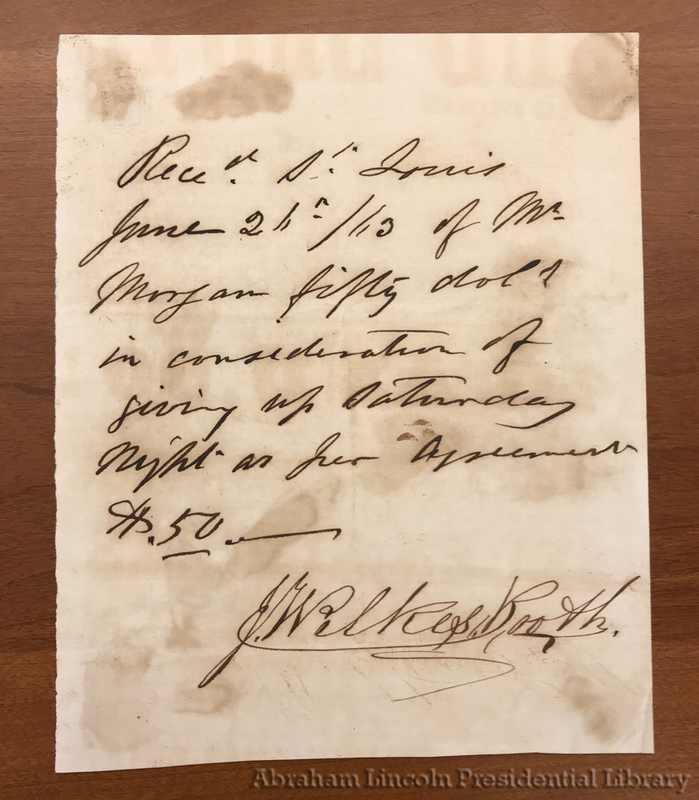 On May 7th, Withers signed a form stating her had received, “a lot of sleigh bells, a triangle, harmonica, and violincella being properties left at Fords Theatre on the night of the Assassination of President Lincoln.” Withers signed for both himself “and Mr. Musgive [sic]”. 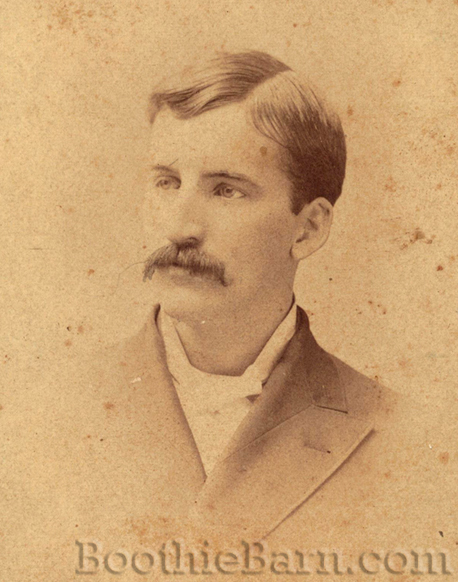 William Musgrif continued to live in D.C. in the few years following the assassination. In 1868, an unfortunate incident caused Musgrif to make the acquaintance of another person who had been at Ford’s on April 14th. On February 19th, Musgrif was in the billiard room of the National Hotel observing a man named William Rogers, who was drunk. When Musgrif attempted to take the billiard balls away from the drunkard, Rogers “hit him over one of the eyes.” A police officer was summoned, arrested Rogers and proceeded to take down the 56 year old musician’s sworn statement. That responding police officer was none other that Officer John F. Parker, the man history has condemned for allegedly leaving Abraham Lincoln unguarded on the night of his assassination. By the mid 1870s, William Musgrif had moved out to Colorado with his son. It is likely he died and was buried there. Chris Arth was the cousin of George M. Arth, the would be soloist for “Honor to Our Soldiers”. His 1901 obituary, which is also one of the pieces of evidence for his presence at Ford’s Theatre, gives a good description of his life. After this, Birdsell proceeds to give the list of names he has been able to determine. After this list Birdsell makes the final statement that since the average orchestras at the time consisted of 10 instruments he believes he is only half complete. Birdsell was likely unaware of Ford’s and Grover’s mutually agreed upon augmented orchestras which were no doubt larger than ten musicians. 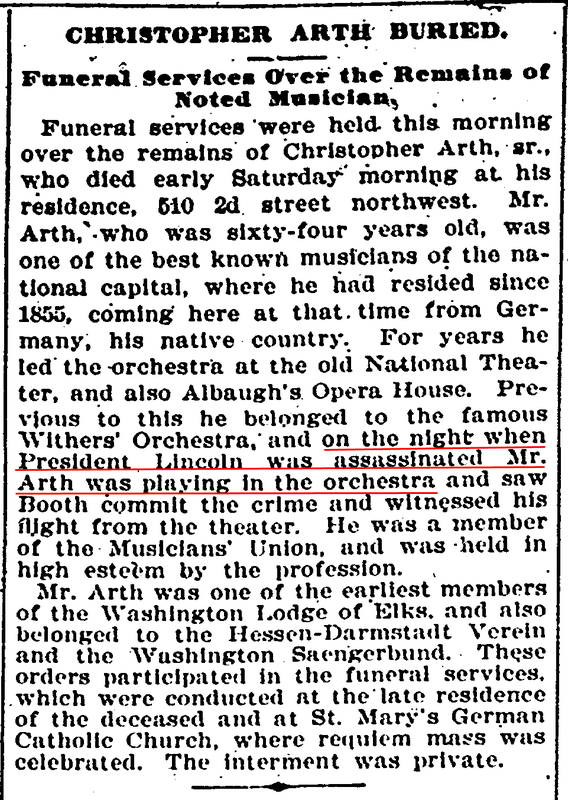 If we trust his obituary and Birdsell’s list, then Chris Arth, cousin of George Arth, was in the orchestra at Lincoln’s assassination. Henry Donch was a native of Germany who moved to the United States in 1854. He lived in Baltimore and was also a member of the Annapolis Naval Academy Band before he moved to Washington. 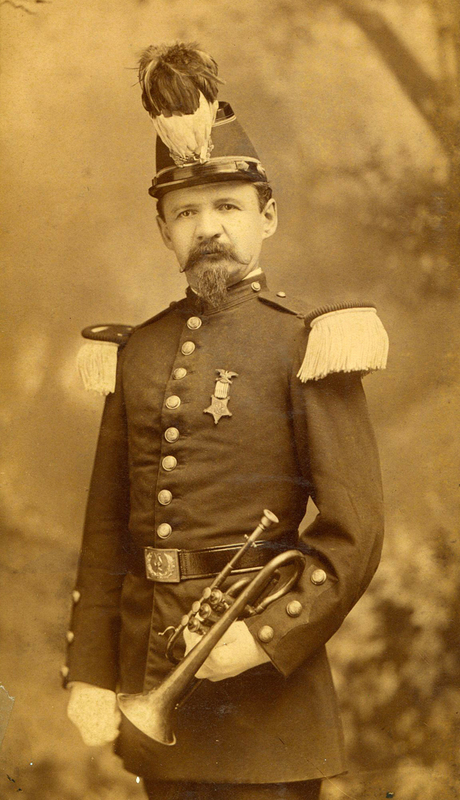 Donch joined the U.S. Marine Band in August of 1864. While the general consensus is that Booth did, in fact, utter the phrase “Sic Semper Tyrannis” after shooting the President, Donch’s contrary claim does not, by itself, prove him to be a liar. The eyewitness accounts from Ford’s vary widely and it’s possible that, in the confusion, Donch truly did not hear or remember Booth stating these words. Coincidentally, Henry Donch would observe another Presidential assassin, though this time during the period after his crime. 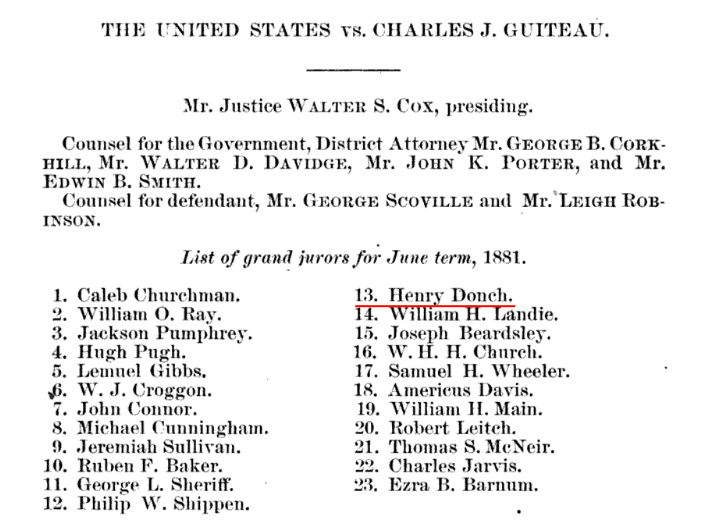 After Charles Guiteau shot President James Garfield, Henry Donch was selected at one of the grand jury members in his trial. Reuben Withers was the younger brother of Ford’s Theatre orchestra director, William Withers. Reuben had joined the same regimental band as his brothers and father at the start of the Civil War, but similarly was sent back home when such bands were disbanded. He joined the ranks of his brother’s brass band and, it appears, the Ford’s Theatre orchestra. Was Reuben Withers truly in the orchestra that night? After years of hearing his brother tell his tale, perhaps he just wanted to include himself in the narrative. Or perhaps he did tell the truth and left the theater before the crime occurred. We may never really know. 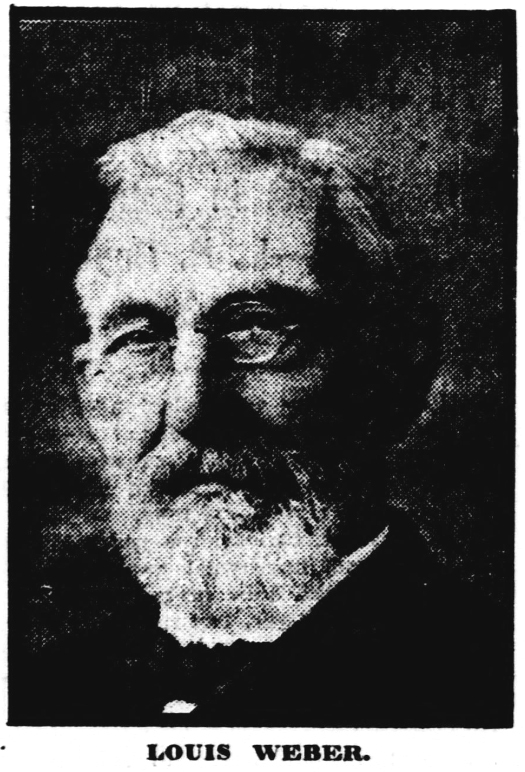 Reuben Withers preceded his brother in death, dying in 1913. The house and business the Withers brothers owned still stands, albeit a bit modified, at 4433 White Plains Road in the Bronx. Henry Steckelberg was born in 1834 in Germany. He immigrated to the United States in 1858 residing at first in New York. When the Civil War broke out he, like the Witherses, joined a regimental band in New York. After returning to civilian life, Steckelberg made his way to Washington and can be found in the 1864 D.C. directory listed as “musician”. It’s hard to tell if the writer of this letter was using knowledge she had obtained from Steckelberg or merely adding her own embellishments and beliefs about the Lincoln assassination story to the basic Steckelberg obituary. The latter part of the paragraph is entirely opinion and the former contains one factual error: there was no rehearsal room “below the orchestra pit” at Ford’s Theatre as the pit was the lowest you could get. While there isn’t much to go on regarding Henry Steckelberg, his obituary does recount that the orchestra was on break during (and therefore didn’t witness) Lincoln’s assassination which is in line with what Scipione Grillo testified to in 1867. It’s possible that Henry Steckelberg was there after all. 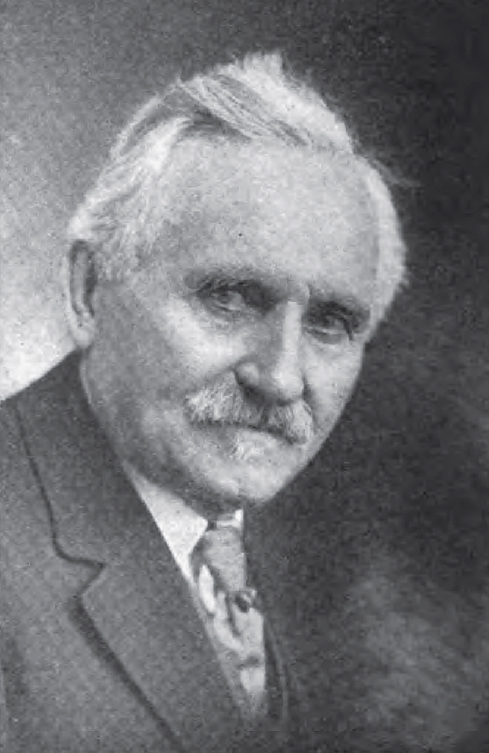 Isaac S. Bradley was born in 1840 in New York. During the Civil War, Bradley joined the Union army where he served as a bugler in the 10th New York Cavalry. Bradley was discharged from the service on November 20, 1865. 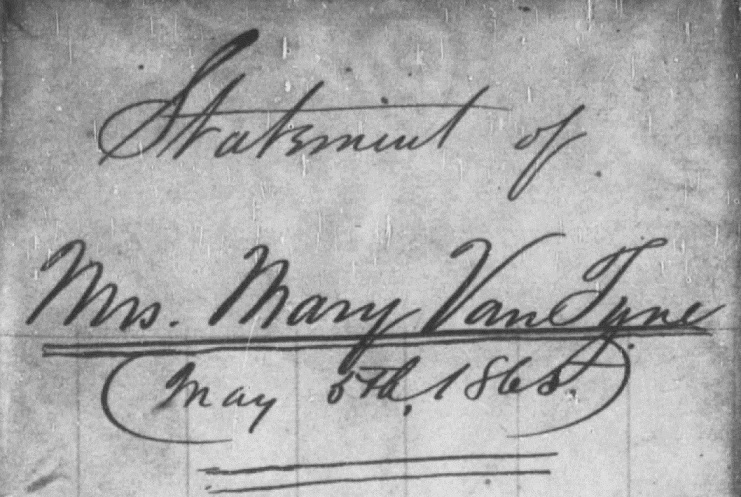 By 1868 he had moved to Dayton, Ohio where he married and started a family. He lived in Dayton for the remainder of his days, becoming a photographer. Bradley died on July 10, 1904. “We were playing very softly when suddenly a messenger came and told us to play louder. We had heard a shot and someone running across the stage above, but we thought nothing of it. The article went on to state that “the order to play more loudly was given in an effort to offset commotion caused by the shooting and to avert panic in the audience.” It’s important to note that Mrs. Forster’s account is in contradiction to the testimony of Scipione Grillo who made it clear that the orchestra was not on duty during the assassination. [The violin] had been given to him when he was about 10 or 11 years old. It had been acquired by his grandfather from the Cremonesis family in Italy, reported to have taught the famed Antonius Stradivarius the art of producing priceless violins. Mr. Bradley was told that the instrument purchased by his grandfather, who served in the Revolutionary War, was made in 1637. A certificate inside the violin bears that date and the name of the maker. Mrs. Forster appears to be the only source that her father was in Washington and a member of the Ford’s Theatre orchestra that night. She was apparently quite convincing though, especially with her father’s violin as a witness. In the 1960s, when the National Park Service was preparing a historic structures report about Ford’s Theatre, Mrs. Forster wrote a letter to George Olszewski, the National Capital Region’s chief historian. Olszewski was convinced enough by Mrs. Forster’s letter that he included Isaac S. Bradley’s name in his partial list of orchestra members. 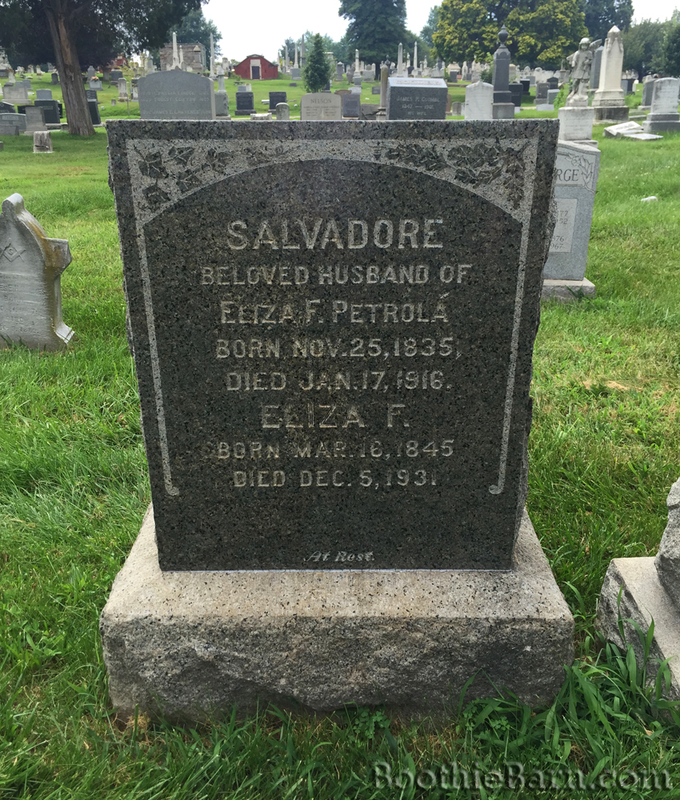 Salvadore Petrola, a native of Italy, came to the United States in 1855 when he was 20 years old. A talented cornet player, Petrola joined the U.S. Marine Band in September of 1861 and remained a member for the maximum time allowed, 30 years. As a band member in the 1880s, Petrola was the assistant conductor of the band, second only to its leader, John Philip Sousa. Petrola assisted Sousa in arranging music for the band and served as its primary cornet soloist for many years. Despite a lengthy search, the only concrete evidence that I have been able to find to support the idea that Petrola was in the orchestra at Ford’s is the list of names John Birdsell, the secretary of the Musicians’ Protective Union, provided to the Rambler in 1925. One additional fact could be taken as, perhaps, circumstantial evidence in favor of Petrola’s presence, however. 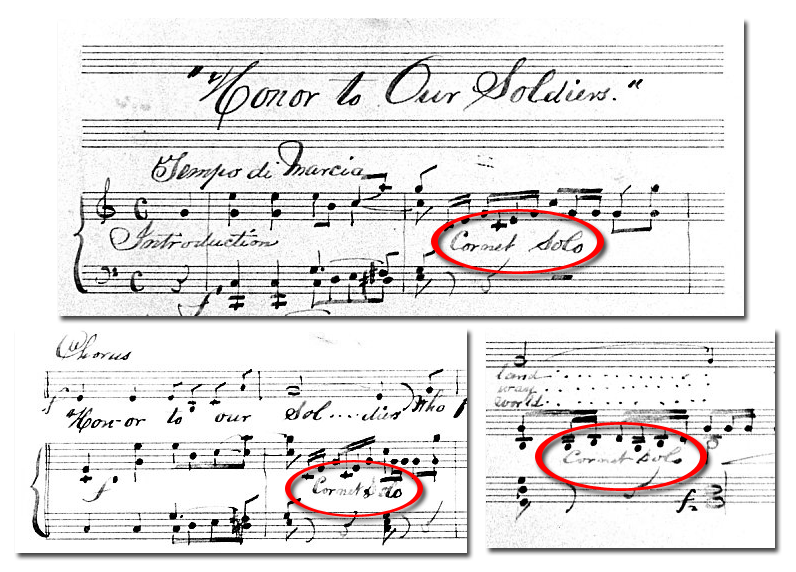 The only instrumental solos contained on William Withers’ handwritten copy of his song, “Honor to Our Soldiers”, is for a cornet. In fact, the cornet gets three solos over the course of the song. Is it possible that William Withers wrote so many solos for his cornet player because he was working with very talented, Salvadore Petrola? We’ll never know. Joseph Arth was the younger brother of Ford’s double bass player, George M. Arth. 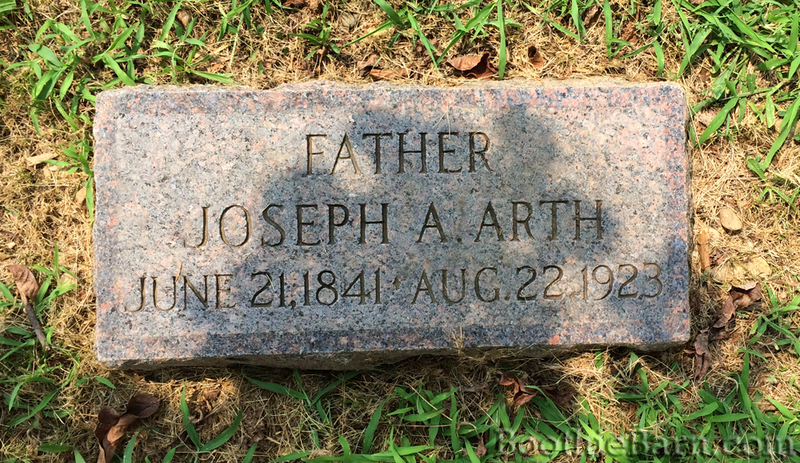 Like his brother and cousin, Chris Arth, Joseph was a member of the U.S. Marine Band. Like Salvadore Petrola, Joseph stayed in the Marine Band for 30 years. It’s not much to go on, but perhaps Joseph was playing alongside his older brother George in the Ford’s Theatre orchestra that fateful night. A pair of drumsticks in the Ford’s Theatre collection. These are said to have been present on the night of Lincoln’s assassination. Could they have been used by Reuben Withers or Joseph Arth? Paul Schneider was born in Germany in 1844 and immigrated to the United States in 1861. During the Civil War he joined the Union army under the alias Ernst Gravenhorst. He served as a bugler for the 5th U.S. Artillery from January of 1863 until December of 1865. In the 1870s, Schneider moved to Memphis, Tennessee, initially working as a musician in the New Memphis Theatre before becoming a music teacher. In 1882/3, Schneider became the second director of the Christian Brothers Band, the oldest high school band still in existence. As director of the band, Schneider and his students performed at important events including playing for President Grover Cleveland in 1887 when he visited Tennessee. In 1892, Schneider was succeeded as director by one of his former students, but remained in Memphis and involved in the musical life of the city. He died in 1912. Bolton was a good researcher, but it appears that even he had difficulty in finding evidence for this claim. His phrasing of “he has been placed” demonstrates a degree of uncertainty. Likewise, the best reference Bolton could find to support this idea was from a 1993 newspaper article about the Christian Brothers Band which merely mentioned that Schneider had been a member of the Ford’s Theatre orchestra without any supporting evidence. Without additional, period evidence, I have some serious doubts that Paul Schneider was present at Ford’s. However, the idea that one of their band leaders was a part of such a historic event is a point of pride to the Christian Brothers Band. 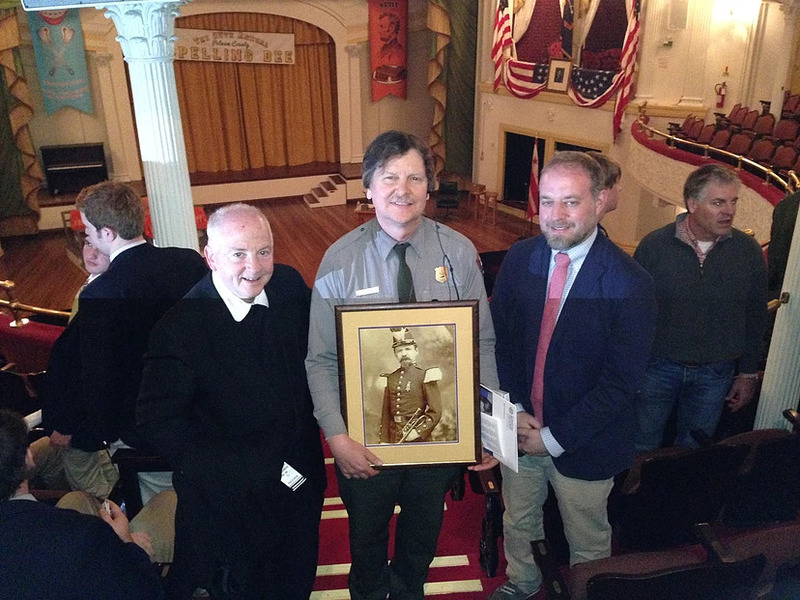 When the band traveled to Washington, D.C. in 2014, they even presented a picture of Professor Schneider to Ford’s Theatre. Unfortunately, despite best efforts, I have been unable to find any verifiable information about Samuel Crossley aside from the story I am going to recount. In 1991, the National Park Service received a donation to the Ford’s Theatre collection in the form of this violin. The violin was said to have been played at Ford’s Theatre on the night of Lincoln’s assassination. A label inside the violin identified its previous owner, a Union soldier by the name of Samuel Crossley. 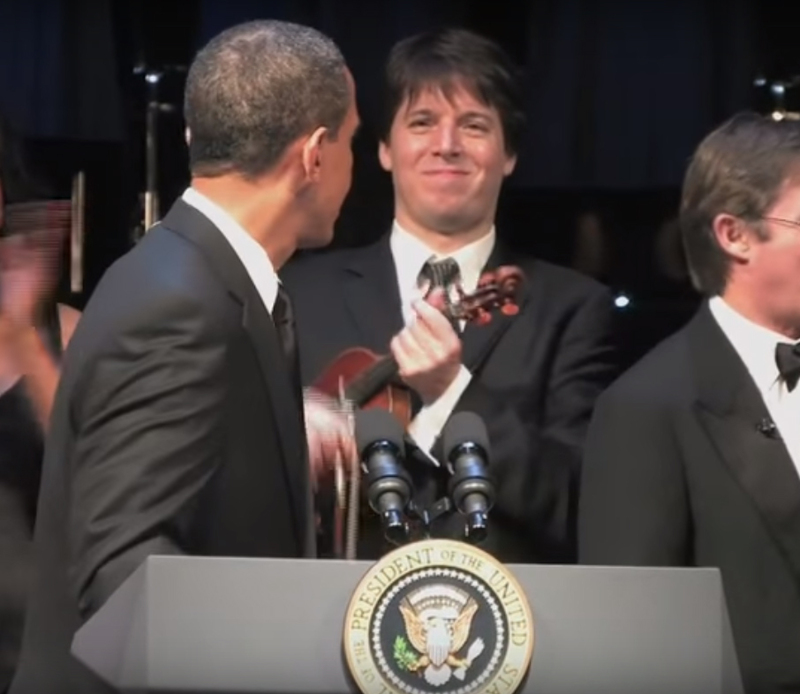 On February 11, 2009, at the grand re-opening ceremony for the newly remodeled Ford’s Theatre museum, noted violinist Joshua Bell played the song, “My Lord, What a Morning” on the Crossley violin. In the audience were President Obama and First Lady Michelle Obama. Though I haven’t been able to find a recording of that performance, in videos of the President’s remarks, Bell can be seen in the background holding the Crossley violin. More information about Samuel Crossley (and the provenance behind his violin) is needed. Luke Hubbard was born in 1848 in Onondaga County, New York. In 1863, Hubbard attemptted to join the Union army but was rejected on account of being under the age limited (he was only 15 at the time). Not one to be deterred, Hubbard waited a year and then enlisted again, this time claiming he was 18 years old. Records verify that Hubbard served as a private in Company B of the 22nd New York Cavalry from July 1864 until he was discharged from service on October 18, 1865. Years later, Luke Hubbard claimed that an unexpected series of events during his tour of service caused him to not only be present at Ford’s Theatre on the night of Lincoln’s assassination, but an acting member of the orchestra. The following comes from two sources, an account that Hubbard gave during his lifetime and his subsequent obituary. Ironically, one of the most detailed accounts we have from a person who claimed to have been in the orchestra at Ford’s Theatre is also the least factual and least reliable. Very little of what Hubbard recounted is accurate. The orchestra was not playing when the shot rang out. 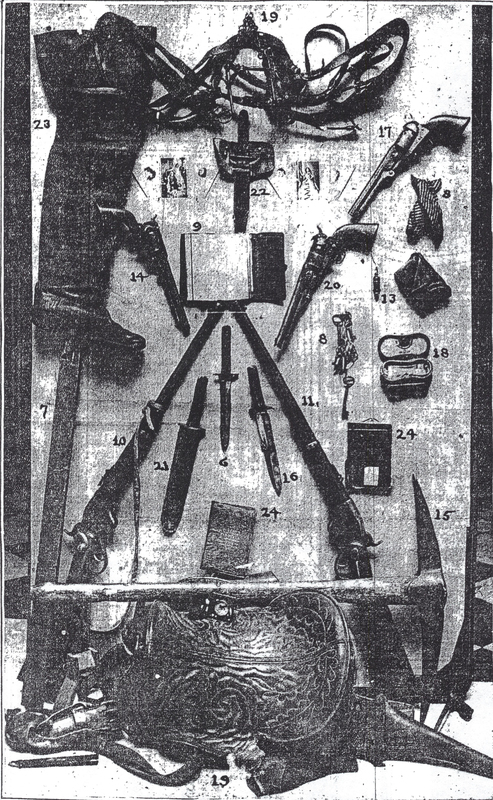 Booth dropped the derringer pistol he used on Lincoln in the box and therefore did not have it on the stage with him. No one grabbed the injured Booth and pulled him out the rear door of Ford’s. The back door of Ford’s was not found to be locked from the outside after Booth passed through it. And perhaps the most egregious (and somewhat laughable) error of them all: John Wilkes Booth was not a friend of Lincoln’s nor did he often join the President in his theater box to “chat”. As entertaining as it is, it’s probably safe to dismiss Hubbard’s account entirely. Still, it’s interesting that the instruments Hubbard claimed to have played that night, the triangle and bells, were two of the instruments William Withers asked permission to retrieve after the assassination. The stage of Ford’s Theatre taken in the days after Lincoln’s assassination. The orchestra pit with music stands and sheet music still in place can be seen at the bottom of the image. Compared with the stars who graced the stages of Victorian era theaters, the lives of theater orchestra members were without glamour or fame. While equally talented in their own specific roles, many of the men who provided crucial musical accompaniment led quiet and largely uncelebrated lives. 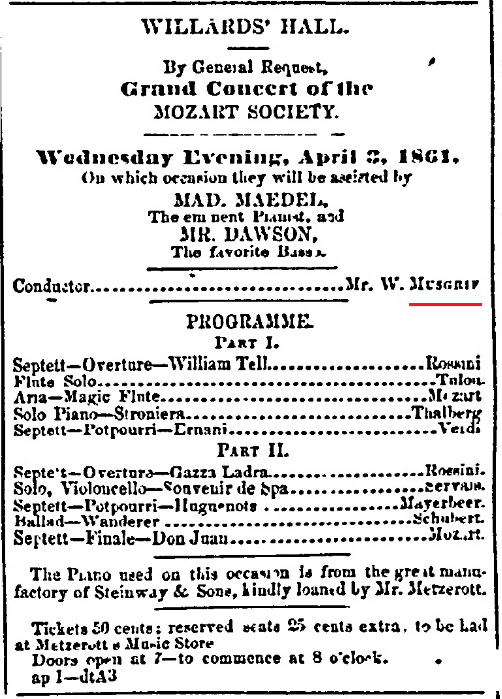 The names listed above are only possible members of the Ford’s Theatre orchestra, with some having much better evidence than others. We only know them because either they chose during their lifetime or their friends and family chose after death, to connect their names with one of the most notable events in our history. This desire to be remembered and connected to such important events leads some people to exaggerate or outright lie. On the reverse, however, it is possible that there were members who did not wish to have their whole musical careers boiled down to a single, traumatic night. How many orchestra members witnessed Lincoln’s assassination, but never talked about it publicly? As time goes on, additional people who are claimed to have been in the Ford’s Theatre orchestra will no doubt be found. When that happens, we must judge the reliability of their evidence just like the names above. If you stumble across a new name, I encourage you to add a comment to this post so that others may evaluate the evidence. The exact identities of those playing at Ford’s Theatre on April 14, 1865, will never be known for certainty. Just like in 1925 and 1962, we still do not have a reliable count of how many musicians were even there, and we likely never will. Known and unknown, the orchestra members of Ford’s Theatre, under the direction of William Withers, have the distinction of having played the last music President Abraham Lincoln ever heard. When this blog first started in March of 2012, it was little more than a shelf on which I could put the small research oddities and tidbits of information I came across. I was still new to the Lincoln assassination field and unsure whether this hobby would turn into anything constructive. Since that time, the community around this site has grown far beyond what I ever expected. As my followers have grown, I have worked hard to provide new and varied content all with the aim of educating others about the events surrounding Lincoln’s assassination. I am very proud at what I have accomplished here on BoothieBarn and, particularly, in the growing scholarship behind the posts I produce. I am, first and foremost, a teacher and that is why BoothieBarn is, and always will be, an educational resource open to all. As an elementary school teacher, I feel there is no higher calling than using your talents to educate others. As I tell my students, everyone has the capacity of enriching the world around them by sharing their unique knowledge and abilities with others. 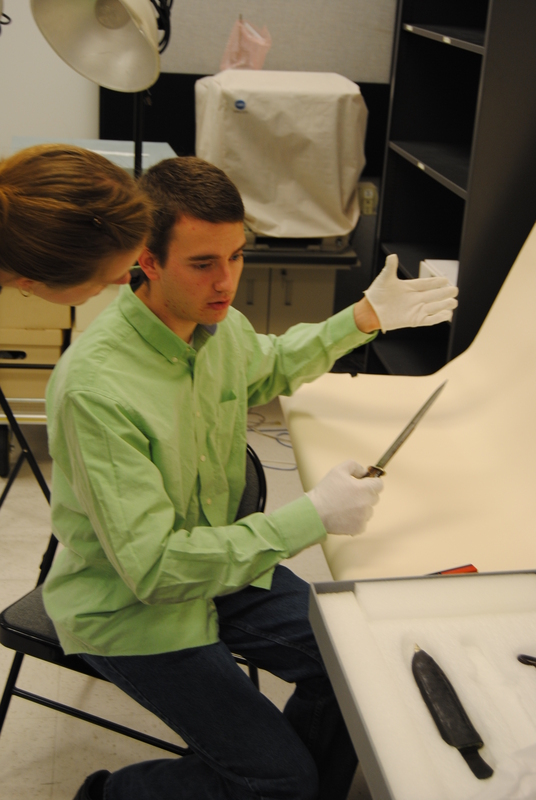 I research, write, and speak about the Lincoln assassination because I enjoy sharing my passion with others. BoothieBarn is not a commercial entity. I make no money in writing or producing content for this site. I have no book deals nor do I make any money from advertisements (in fact, I actually pay to keep ads off of this site). In addition, the majority of the speaking engagements Kate and I are asked to do are unpaid. 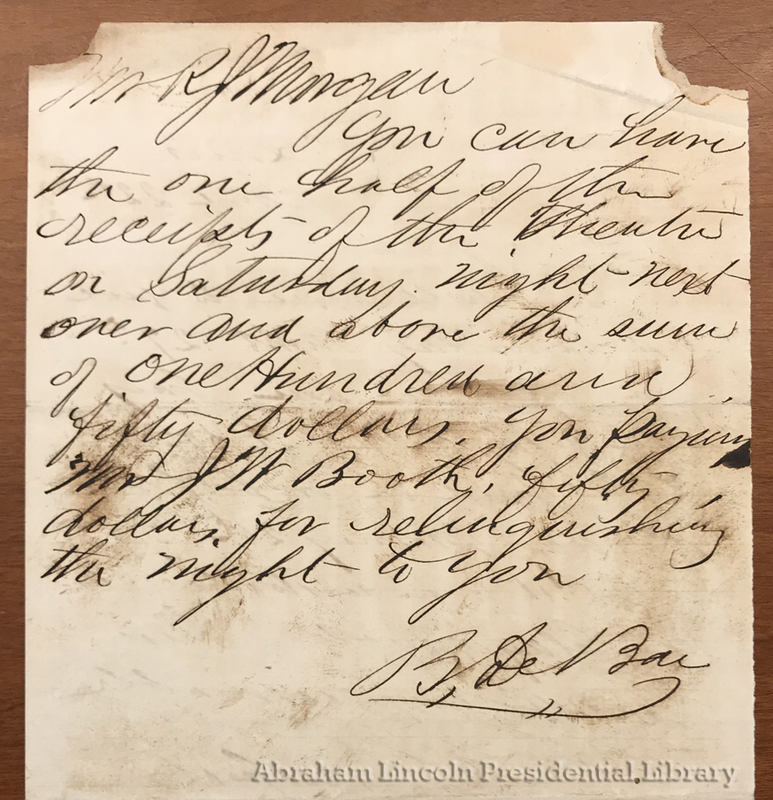 This website, and the Lincoln assassination story in general, is a hobby for us and one that we enjoy, but there are some real costs associated with owning, maintaining, and producing content on BoothieBarn. In webhosting fees and research subscriptions alone, I spend over $400 a year. Even this is a drop in the bucket compared to the costs of books and travel to historic sites and museums when researching new leads. This admission is not a complaint at all, but is merely meant to demonstrate that all we do here on BoothieBarn is a true labor of love. With that being said, I have decided to launch a Patreon page for BoothieBarn. Patreon is an online system that allows individuals to provide some financial support for the work being done by their favorite creators. The website operates a bit like those infomercials you see on TV where you make a pledge to donate a certain amount each month. You choose whatever amount you would like to give and, once a month, Patreon will charge your credit card that amount and give it to your chosen creator. My reason for joining Patreon is the hope that some of you might consider becoming a patron of BoothieBarn and help provide some financial support towards the work that we do. Your pledge would help to offset the costs associated with owning BoothieBarn and conducting research for it. A pledge of any amount would truly help to lift some of the financial burden that creating content for this site entails (especially from the shoulders of a couple of newlyweds on a teacher’s salary). I am not expecting that we will ever be able to break even regarding the costs of our work, but every little bit makes an impact. Those of you who chose to become a patron will not only have our deepest thanks, but also access to some patron-only material on our Patreon page. 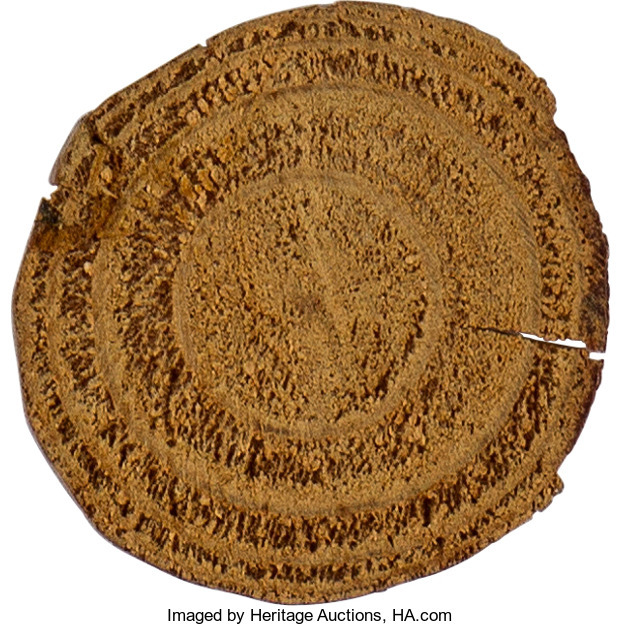 From time to time I will be adding images and short descriptions of some of the Lincoln assassination artifacts that we have seen in our travels. I’m calling this section “The Vault”, and we already have a few entries ready to go in the “Posts” section of the Patreon page. A recurring pledge of any amount grants you ongoing access to The Vault and the treasures inside. It’s our way of thanking you for your support. I hope that you will consider becoming a patron of BoothieBarn and help us continue to provide thought provoking, educational material on Lincoln’s assassination. Please click the “Become a Patron” button below to be taken to our Patreon page to read our story. There you will find information on how the Patreon system works so that you can decide whether giving is something you feel you can do. Even if you don’t have the means to contribute, I appreciate your continued support of our efforts here on BoothieBarn.